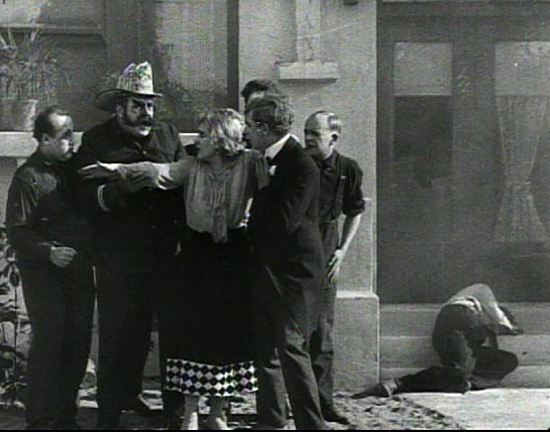 'The Fireman' was Charlie Chaplin's second Mutual film in 1916 with Edna Purviance. This scene shows Charlie about ready to drive the fire wagon out of the station. 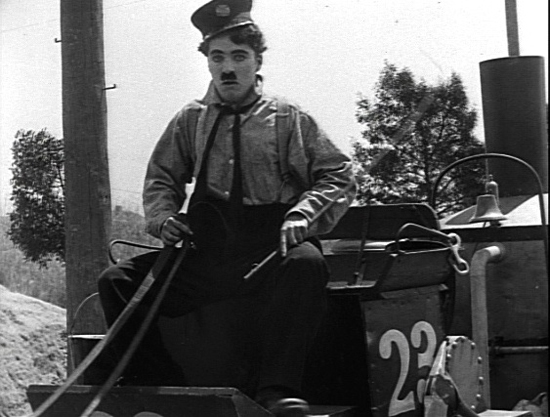 But did Charlie Chaplin really drive the wagon out of the station??? Take a closer look at this next take as 'Charlie' drives the wagon out. Pull out your copy of the film to take a closer look. After the wagon pulls out of the station and comes to a stop, this closeup is taken, which is clearly Chaplin. But the man driving the wagon out of the station clearly is not Chaplin. The head is a different shape, Chaplin's curly hair is gone, and moustache appears larger. 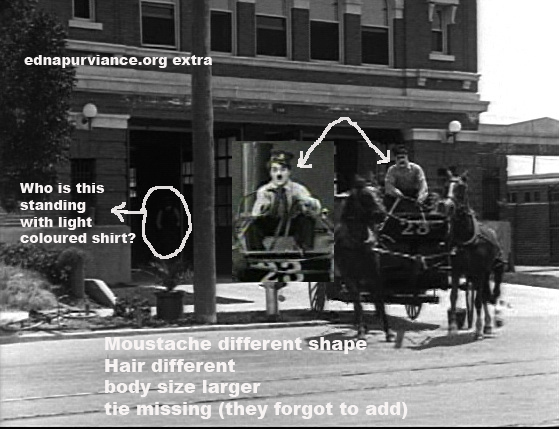 They had him wear the light coloured shirt, like Chaplin's, but forgot to place on the dark tie, that Chaplin wears in the other scenes. It does take skill to drive a team of horses, so Chaplin looks to had someone else do that job. And interesting to see a mystery man, inside the station, with hands in pocket and appears to be watching the filming. None of the other actors are dressed like him. 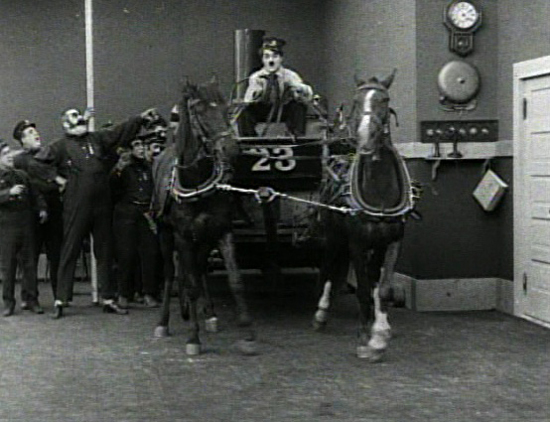 Maybe Charlie's brother, Sydney, was watching the filming, but whoever it is, Chaplin had someone else drive the wagon team out of the station. I don't know who it is, but Eric Campbell is the only person to match the size of man. 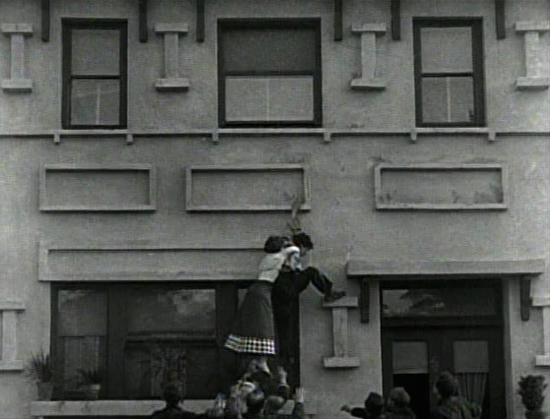 In the fire rescue scene, Chaplin carries a mannequin down the building. Interestingly, the 'female mannequin' doesn't have blonde hair, like Edna's, but brunette hair (nearly black looking in this light). At the bottom of the building, we can see Edna's blonde hair, shining in the sun.